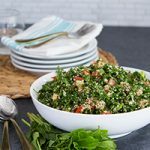 The classic Middle Eastern salad made keto with simple, fresh low-carb ingredients. 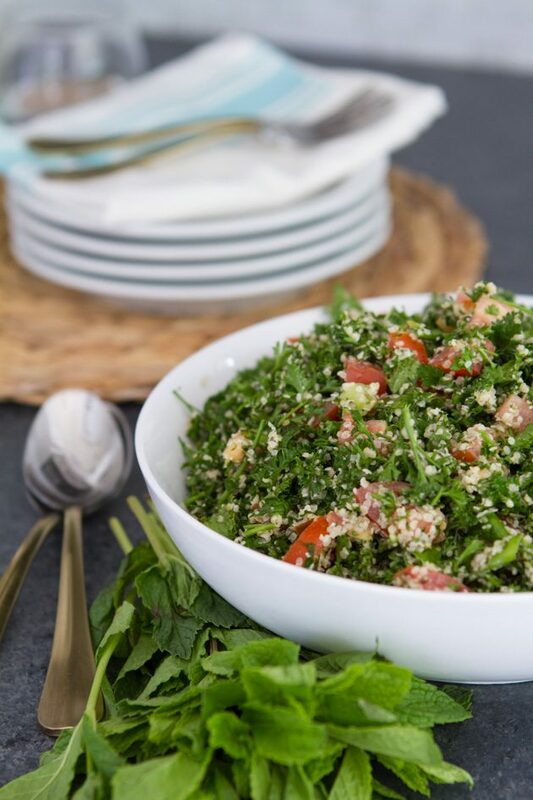 Also referred to as tabbouleh or taboūleh. We were invited to a VERY last-minute potluck dinner at the end of September. Like, “Hey we’re having a potluck, wanna come over in 15 minutes?”. Yeah, like that kind of short notice. We’ve been eager to connect with new people since we transitioned to life on the road (we’re traveling full-time in our RV and vowed to say yes to as many invites as possible), so we were going to the shindig, I just had no idea what to prepare! Of course these sorts of invites only happen when you should have gone grocery shopping 3 days ago but didn’t because you were either a) too lazy, b) spending time at the beach c) got lost in a Netflix binge. You don’t want to be THAT girl that doesn’t show up with something at a potluck, so I was going to bring something. I had the basics in the pantry: oil, lemon juice, hemp, a clove of garlic… and the fridge wasn’t all that eventful either… some leftover mint leaves from a lamb kebab recipe I’d made a couple of days prior, green onions, tomatoes, nothing fancy. 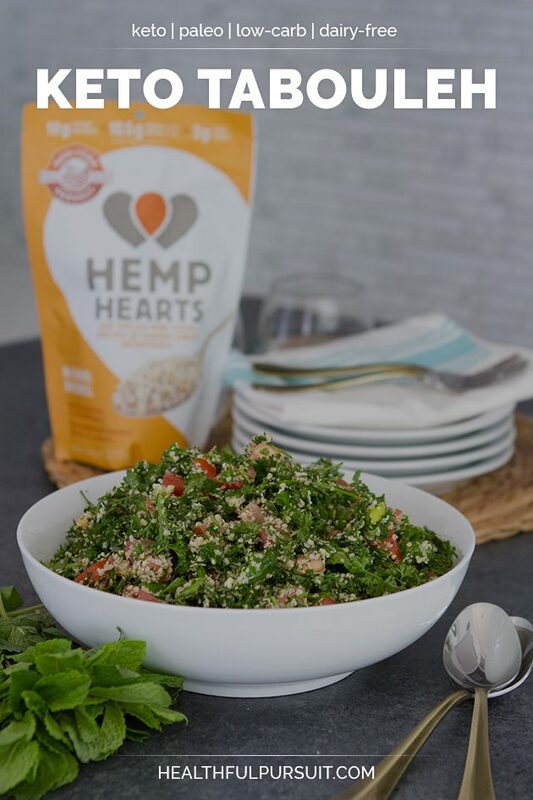 I went out on a whim and decided to use the Manitoba Harvest Hemp Hearts as the base for the salad, like a tabouleh (aka tabbouleh or taboūleh) and it was a HUGE hit. Hemp hearts win again, is there anything hemp can’t do? For real, I’ve used Manitoba Harvest Hemp Hearts as a base for keto fat fudge (without the dairy), porridge (made of nothing but nuts and seeds), to make my own dairy-free milk, and so much more. I chose Manitoba Harvest because it’s Canadian, affordable, accessible (you can find it at most grocery stores, Costco, and the like), and the people that work at the company are AMAZING… I’ve met most of them, they’re great people and that totally matters. So let’s get to this recipe already!? 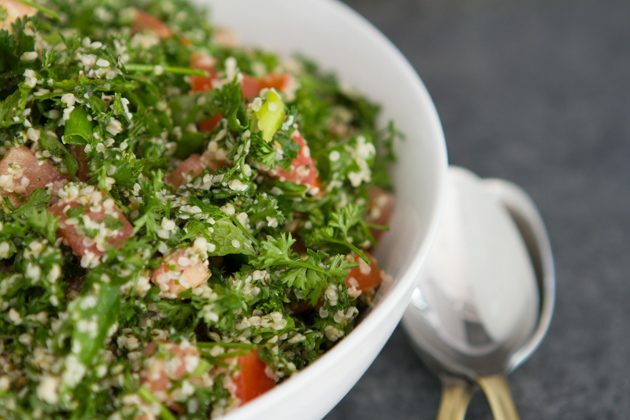 Have a favorite tabbouleh recipe you’ve been dying to remake but not sure how to prepare it without the carbs? I have the solution… and it’s NOT cauliflower.. This recipe is sponsored by Manitoba Harvest. MACROS 78% fat, 7% carb, 14% protein. Place the olive oil, lemon juice and sea salt in a large bowl. Whisk to combine. Add remaining ingredients, toss to coat, and serve.